Why do landscapers oppose the government’s Cynodon dactylon plan? The South African Landscapers’ Institute (SALI) issued a strong condemnation regarding the government’s proposal to list Cynodon dactylon as a Category 2 invasive species today. SALI categorically oppose any proposal that the indigenous and water wise Cynodon dactylon be declared a Category 2 invasive species across South Africa. Is indigenous to South Africa. Is planted in sports fields, parks, protected areas, along highways and across tourist resorts. Is a valuable, drought-resistant, water wise grass species. Is an important species to flora and fauna ecosystems. Is critical to South Africa’s biodiversity. Is planted across South Africa in schools, national parks, municipalities, landscapes and tourism facilities. There are currently NO indigenous plant species listed in the National Environmental Management: Biodiversity Act (No. 10 of 2004) (NEMBA) Alien and Invasive Species (AIS) Lists and Regulations. Two indigenous frogs are currently on the South African National List of Invasive Species. The government’s intention to add a third indigenous species to the National Invasive Species List is unworkable. “I am not sure that it is practical to declare Cynodon dactylon a category 2 invasive species”, says Dr Sue Milton-Dean, a top grassland academic, grass seed expert and restoration landscaper. What are the issues of concern in the landscaping industry? “We have endured 2 years of the most crippling drought in the Western Cape”, say Richard Morris of Starke Ayres, Cape Town. “This has rendered traditional coastal Buffalo grass (Strenotaphrum secundatum) and Kikuyu grass (Pennisetum clandestinum) non-existent in most domestic residences, drought ravaged public open spaces, public gardens and parks. Buffalo and kikuyu have has also disappeared from road verges, commercial landscapes, school sport fields and important environmental areas where they not irrigated as neither are drought-tolerant”, he adds. “Yet with a little grey water irrigation on indigenous Cynodon dactylon we are able to control dust, erosion, many coastal and hydrophobic sands by supply water saving options to school sports grounds in drought ravaged areas dry areas with and without poor infrastructure. We use Cynodon dactylon as an alternative grass sold and planted as roll on lawn or sold as runners or plugged rooted cuttings or seed”, says Morris. “A more in-depth regional study of Cynodon dactylon in the Western Cape must be done before this species needs to be listed in this region. In my opinion, the advantages far out way its consideration for listing as Invasive”, says Morris. “Cynodon dactylon comprises numerous strains or ecotypes some of which are fertile and produce viable seed and other varieties which although they may produce inflorescences, the seed is sterile or of low viability”, says Mike Kruger of Top Crop Nursery (incorporating Superlawn), Pietermaritzburg. Cynodon transvaalensis is a species that is very similar to Cynodon dactylon and comprises varieties that are also fertile and others that are sterile. The identification of the two species can only be done by the inflorescence. The naturally occurring Cynodon spp. have always been shy seeders. No commercial production of Cynodon spp. seed occurs in the RSA. This is probably because the naturally occurring species do not produce massive amounts of viable seed. Seed of Cynodon dactylon however is currently imported into South Africa from the USA (Bermuda grass) and other countries. “Cynodon dactylon has prevented massive areas from being eroded”, says Kruger. “It holds what soil is left and begins the process of rebuilding it. Almost every lawn in South Africa will have some or more of the species. As a lawn it has many uses, it is drought tolerant and needs less irrigation than other lawn species”. The two species (C. dactylon & C. transvaalensis) are considered pioneer grasses. Both are indigenous to South Africa and they are used extensively as crops to rehabilitate areas that have been denuded of cover. In many of the summer‐rainfall areas of South Africa, Cynodon species are components of seed mixes which are sown to form a vegetation cover to reduce the risk of high rates of soil erosion on disturbed ground such as mine tailings, road cuttings and pipeline routes. In most instances in higher rainfall areas, if a local Cynodon spp. is planted as a cover crop and if left alone and it will grow rapidly and throttle itself. To maintain its vigour, it needs to be cut to prevent it dying out. ‘In drier areas it maintains itself as long as it is reduced by traffic, grazing or mowing. Proof of this is that it occurs on every road and highway across the country especially where the road verge is being maintained. Both species have for many years been popular lawn grasses in urban areas and as a result now cover many hundreds of hectares”, says Kruger. “In other situations, where rehabilitation specialists have been concerned with avoiding genetic contamination of locally‐occurring Cynodon spp., sterile varieties of C. dactylon have been planted as plugs or runners, and sometimes even as turves. Turves, in particular, have proven to be very effective in reducing soil erosion, on steeply‐sloping terrain in areas prone to high rainfall which occurs as high‐intensity events”, says Kruger. Every road cutting that has been ‘hydroseeded’ since its introduction in the early seventies has used Bermuda grass seed (Cynodon dactylon) in its mix. To therefore control the propagation and the planting of the species is futile. Cynodon dactylon is not a threat to the environment and to the contrary, is one of the most important grass species available to rehabilitation experts, landscapers, sportsmen and gardeners in the country. Where is Cynodon dactylon turf planted? (a) Golf courses – Blair Atholl, Thatchfield and now also Leopard Creek green surrounds, fairways and tees with Cynodon. Leopard Creek Country Club has converted their entire course from Kikuyu to Cynodon to save on water usage. (b) Landscaping – It is with landscaping where this turf type makes its mark. Cynodon represents 20% of our annual instant lawn turf sales. 32% of specialised turf installations are completed with Cynodon dactylon. All ‘Water-Wise’ landscaping installations are completed with Cynodon spp. (c) Parks and Grounds – due to its resilience against drought heat and infertile conditions, Cynodon dactylon is present at more than 65% of our natural municipal parks and grounds. (d) Most school fields does have cricket and athletic facilities. 50% of these facilities are maintained as Cynodon dactylon. (e) Stadiums: Polokwane and Mbombela both have stadiums planted up with Cynodon species. To remove this indigenous species from all the locations in which it is currently planted would cause ecological devastation across the country and result in job losses. Previous case studies (eg watercress) in the horticultural industry have shown that it is almost impossible to trade in Category 2 invasive species. All seed of Category 2 species have been withdrawn from the retail trade as it is almost impossible for retail customers to be able to obtain a permit before buying packet seed in store. If the proposal goes ahead, all turf growers and landscapers would arguably have to cease production in all Cynodon dactylon species and varieties until permits were obtained. Permits would have to be applied for possession, transport, propagation and sales. History has shown that when the public is informed that a species is now a declared invasive species, there is an unprecedented collapse in the market, desirability of the species and trade in that species. Against this background, SALI oppose all measures by the government to impose a Category 2 status – on a much loved, indigenous, water wise turf species – as unworkable, unrealistic and not in the country’s interest. 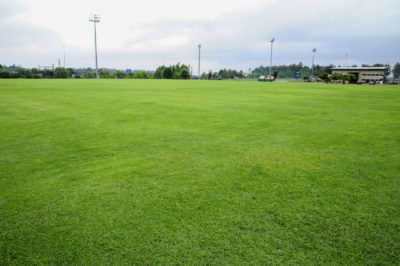 Image credit: Cynodon is planted up on the hockey sports field, University of Pretoria. Pic: Servest.